Gross capital expenditure in the review period totalled EUR 49 million (433), comprising EUR 5 million (393) in acquisitions and investments in securities, and EUR 44 million (39) in intangible assets and property, plant and equipment. Depreciation, amortisation and impairment for the review period amounted to EUR 65 million (68). Maintenance capital expenditure for 2013 will be below depreciation. In June 2013, Eastern Shipbuilding Group, Inc., of Panama City, Florida contracted Wärtsilä to supply an integrated solution for a new multipurpose support vessel for Harvey Gulf International Marine, LLC of New Orleans, USA. 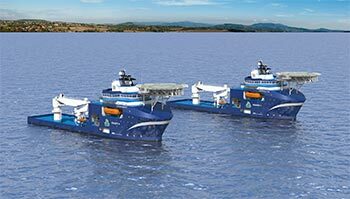 Expected to begin operating in the offshore oil fields of the Gulf of Mexico by late 2015, this vessel is the first in a series of three, and the contract includes an option for the supply of equipment to the remaining two. As well as the engines and the complete electrical and automation system, our scope of supply includes turnkey installation of the Wärtsilä Control & Communication Centre (3C) integrated bridge, navigation, and communication control system. Wärtsilä 3C is a fully integrated vessel control system with a single interface. It allows the seamless integration of all the essential vessel control systems, providing a vital link between the bridge and the ship’s automation, engines, and propulsion control systems. Also included in the comprehensive solution is a long-term service agreement. The five-year agreement covers six LNG-fuelled offshore supply vessels and up to three multipurpose support vessels, and includes all the Harvey Gulf vessels that have recently been fitted with Wärtsilä equipment. “Harvey Gulf is very pleased to continue the relationship with Wärtsilä for the supply of their integrated solution for our first-of-its-kind U.S. Flag Multi Purpose Support Vessel. Wärtsilä has shown total commitment to the needs of Harvey Gulf by means of support during the initial design, construction, delivery and service agreements. Harvey Gulf looks forward to continuing this relationship on future endeavors,” commented Shane Guidry, CEO of Harvey Gulf International Marine.